Passaic Mayor Alex Blanco pleaded guilty to federal bribery charges in a Newark court on Thursday and has resigned from office. Blanco, 44, admitted to taking $110,000 from two unnamed developers for an affordable housing project in 2011. He signed a plea agreement in September. "He regrets his actions. He takes responsibility for his actions. He will submit a letter of resignation today," Blanco's attorney told NBC 4 New York. The Democratic mayor will be sentenced Feb. 23. 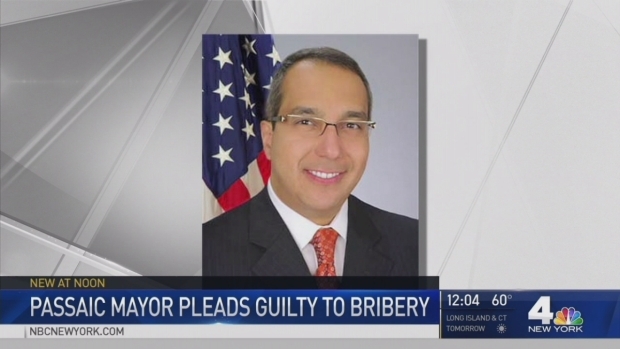 Passaic Mayor Alex Blanco pleaded guilty to federal bribery charges in a Newark court on Thursday and will resign. The U.S. Attorney's office said Blanco, a podiatrist who was first elected in 2008, approached developers about a project for low-income housing on Paulison Avenue in 2011 and told them they would have to give him a sizeable payment for the project to go forward. Then, after the city released $216,4000 in federal Department of Housing and Urban Development money for the project, prosecutors said that Blanco arranged another meeting with the developers and accepted $65,000 in bank checks. A few days later he took another $40,000 in cash. He received the final $5,000 several months later. Prosecutors said that most of the money Blanco took came out of HUD money provided to the developers. U.S. Attorney Paul Fishman said that Blanco's behavior "demonstrates aggressive and appalling greed." "By soliciting these payments from developers, he took for himself federal money that was intended to help provide housing for the city's poorest residents," Fishman said. "We expect our public officials to behave differently." As part of the plea agreement, Blanco will pay $110,000 in restitution. He won office on a platform of fighting corruption after his predecessor Samuel Rivera was convicted of taking bribes in 2008 and made history as the first Dominican-American mayor elected in the U.S. Yet Blanco now becomes the third Passaic mayor in the last 25 years to be convicted of, or plead guilty to, a federal crime. Former Mayor Joseph Lipari was found guilty of extortion and income tax evasion in 1992. The community of 70,000 people bills itself as the fastest-growing city in New Jersey. In a statement, the Passaic City Council said it is moving swiftly to assure the continuity of local government and would be scheduling an emergency meeting to discuss the appointment of an acting mayor. "Today is a very sad day for us all. Mayor Blanco has been a friend, but his actions constitute a violation of the public trust, and that is simply unacceptable," the statement on behalf of the seven councilmembers said. "His guilty plea today will hopefully allow us all to move forward in the best interests of all of Passaic's residents."